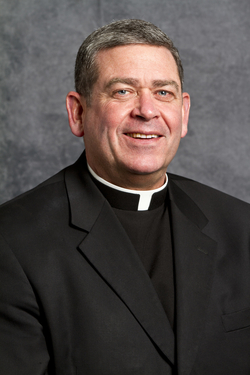 Father Scott Donahue has spent the last 25 years as president of Mercy Home for Boys and Girls, a Catholic organization that has provided service programs for at-risk children in Chicago since 1887. The mission of Mercy Home is to offer services and support for children in crisis to help improve their lives and realign their futures. Mercy’s residential program welcomes boys and girls from as young as sixth grade to live on campus at Mercy Home, 24 hours a day. Currently, there are 100 boys living on the male campus and approximately 40 girls living at the female campus, according to Donahue. Through Mercy’s Friends First program, trained adult mentors are matched one-on-one with children in the community. Mercy’s after school programming includes courses in nearly 30 electives that children can participate in from home. Tutoring is also offered as a way to help children enhance their education. Donahue was instrumental in establishing the Academy at Mercy Home, a program helping children receive the experience needed to secure jobs and internships through partnerships with local businesses. On Tuesday, Mercy Home will celebrate the graduation of 51 Mercy Home students with a luncheon at the Hilton Chicago. The commencement will honor those Mercy residents graduating this year from local elementary schools, high schools, and colleges. More than 800 guests are expected to attend, including leaders in higher education, business and government, according to a press release. Donahue said the nonprofit’s services continue to aid graduates even after they leave Mercy Home. “One of the hallmarks of Mercy Home is our AfterCare program,” Donahue said. “Once a young person has been part of our family at Mercy Home and residential, we continue to provide wrap-around services for them when they leave the Home.” Services in the AfterCare program include helping individuals prioritize their life goals and connecting them with external resources to help achieve those goals. The Daily Whale recently had the chance to speak with Father Donahue to learn more about Mercy Home for Boys and Girls. An edited transcription follows. DW: Tell me about the history of Mercy Home. SD: Mercy Home has been in the city of Chicago for 128 years. It was founded by a couple of Irish priests out of the Boston area. They came to the city when the city was really a railroad hub. They found in the streets a number of young boys and young men who had jumped on the rail cars to come to the city to find fame and fortune. And [the young men] found themselves out on the street: homeless and being taken advantage of. And so [the priests] went to the Bishop of Chicago at the time and they asked if they could start a home for homeless boys. So that began, as I say, 128 years ago and the mission has continued ever since. DW: Does Mercy Home serve children throughout all of Chicagoland? SD: We don’t have any boundaries. Primarily, our children come from pretty impoverished neighborhoods. They’re children who are a couple of years behind in schools. All of the children have experienced trauma or abuse in their lives. So primarily throughout Chicagoland, but also throughout the state, the county, sometimes even out of state and out of country. DW: What are the age ranges of the people you serve? SD: We’re licensed for sixth grade [and] up. So that’s the youngest we can take is sixth grade. DW: And then up until any age? SD: Yeah, that’s one of the things that’s a really important distinction because we’re 99.7% privately funded and we don’t depend of government money. The government can’t tell us how to run programs and who comes and who goes and how long they stay. So once we make a commitment to a young person, we become family for them and they can stay connected to us for as long as necessary until they really can live independently in life. DW: How many children, overall, are engaged with Mercy Home programs? SD: Overall, more than 600 children and families receive services from the Home. DW: Can you explain a little bit about what the Academy is? SD: When I first came here 25 years ago, the folks that were doing the youth care work were doing all the things we do therapeutically for the kids: making sure they get to their doctors’ appointments, go to school, anything a family would be responsible for. What I came to realize is that we needed another department, so I created the Academy a couple of years ago. The Academy works hand-in-glove with what we’re doing programmatically with the children. It’s all about getting them into the right schools, getting them the right education with all the tutoring that is involved, about preparing them with life skills so that they’re ready to enter the work world. We actually provide internships for over 40 children in the city with businesses. These are professional internships during the summer. So there’s a career track and an educational track. DW: Aside from the services that you provide, what does Mercy Home do to engage with the community? SD: One of the expectations we have for all of our young people and the co-workers here is that everyone gives back to the community. So all of them, every single one, is involved in community service of one kind or another. So they’re feeding the homeless. Right now we’re raising money for the tragedy that happened in Nepal. We visit nursing homes. But they all have to learn to give back and how important that is. Then, once a year, we take all that information – all of what our young people have been doing in programs – and, the tradition has been, the mayor always comes and visits and lights our Christmas tree. So Rahm Emanuel has done that, and we present to the city, on behalf of Mercy Home, all the good works that this Home is about. DW: In regards to the AfterCare program, how long do you stay in touch with an individual after they leave Mercy Home? SD: Think of your own family. How long will your family keep in touch with you? That’s what we are, we’re family. And so, they always know they have a place to come home to that will continue to provide the services so that they can live well. … Until they kind of declare their independence or are living independently and don’t come back, we are there for them. DW: What kind of volunteer opportunities are available to the public at Mercy Home? SD: All of our children receive tutoring four nights a week. So to come and be a tutor is one way in which you can volunteer. Another is our Friends First program. They are trained mentors, and we ask for two or three Saturdays a month – four hours of their time – to actually mentor, to be a big brother, big sister – I use that because people are more familiar with that language – be a Friends First volunteer. That’s a program in which we have about 100 matches right now, but we can always use more. There’s a waiting list of kinds and never enough mentors. So that’s another significant way. We have a number of fundraisers and folks can volunteer in fundraising opportunities that we do here for the Home. Currently, we’re trying to find about 300 runners for the [Chicago] marathon to run for Mercy Home for Boys and Girls and raise money. Right now I think we have about 186 signed up, but we’re looking for more to go out and run for kids. DW: What inspired you to work for an organization like Mercy Home? SD: I have been ordained a priest for 33 years. I’m 61 years old and I’ve been involved with the Home for 25 years. Prior to that, I was director of vocations here in the Archdiocese of Chicago, and I’ve always stayed and worked in a parish as well. That’s really important for me as a priest. … But what got me involved is there was a board that go started 25 years ago here at the Home called the Board of Regents. I was asked to be a part of that board. As I came to know the mission of the Home, as I came to see the tremendous need from young people in the city, the tragic environmental situations and the trauma that they’ve experienced, I fell in love with the mission to help these kids. I’ve been here ever since. It’s not always easy, as you can imagine, but I do love it. DW: What’s been your experience working with Chicago’s archbishops? SD: I knew Cardinal Bernardin extremely well. I would say we were dear friends. Cardinal George supported the work that we do here, and he was very good to us. And the new Archbishop [Blase Cupich], I’ve met with several times. He couldn’t be more supportive of this ministry. He has a great heart for the poor. He has a great heart for the disenfranchised. He has a great heart for people who have experienced suffering in life, and that’s really the story of the kids at Mercy Home. He’s been terrific and very supportive.